history of the Clumber Spaniel, computer records, dogs that collect, how puppies develop, postage stamps to feature the breed, and what it is like to live with Clumbers. 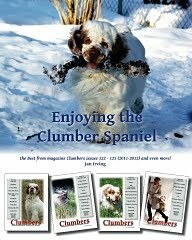 An excellent resource for a Clumber lover and still very interesting to other dog folk. Meet Craig Crouch of Friars Clumbers, USA. Craig is a noted breed historian and advocate of the all functioning Clumber for show competition, obedience and field work. THE COLLECTOR DOG…..No not collecting dogs….Dogs who collect! Not a story about Clumbers, but there are Clumbers who do collect! What is it like to share your life and space with a Clumber?